Questions to answer from this page. 1. 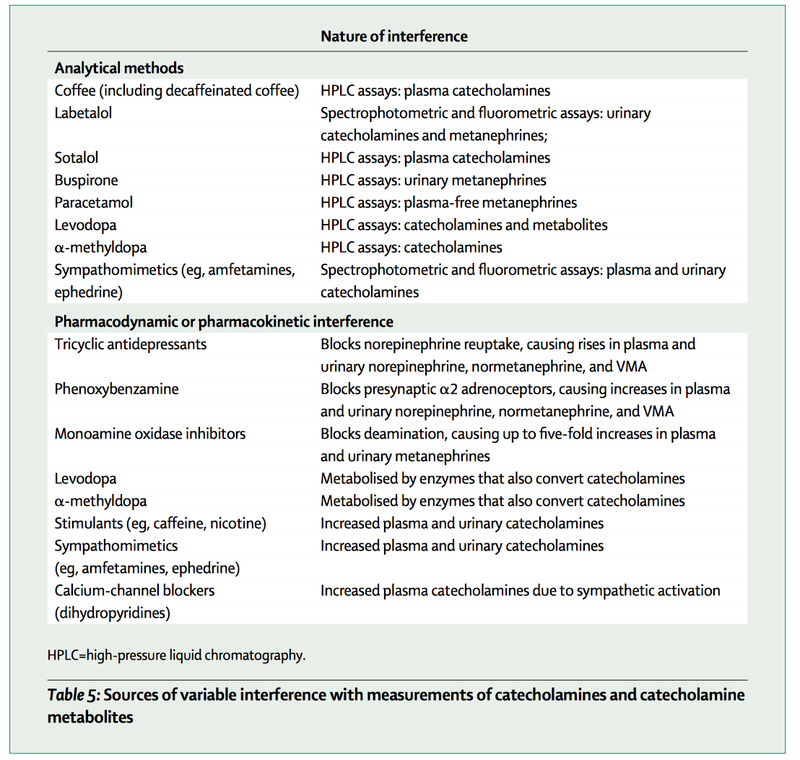 Identify the causes of Adrenal Insufficiency related to normal aldosterone production? 2. 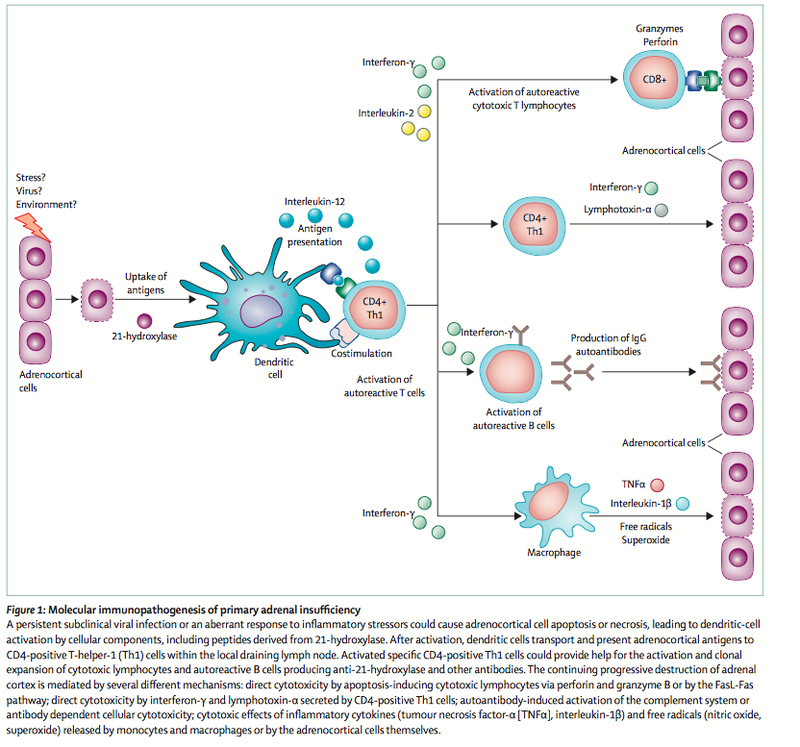 What are the 8 symptoms, 5 signs, and 7 biochemical findings in adrenal insufficiency and their prevalence? 3. 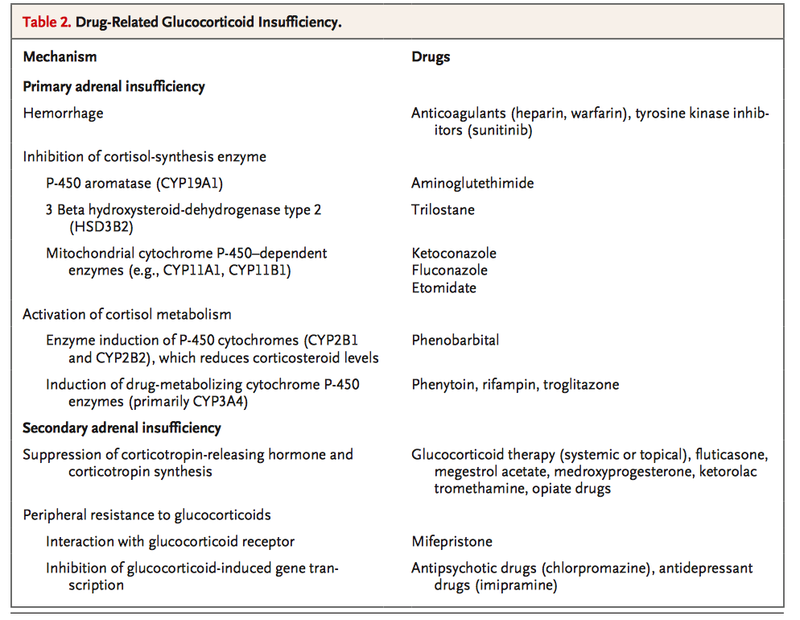 Identify the differences in the management of acute adrenal insufficiency vs chronic adrenal insufficiency? 4. 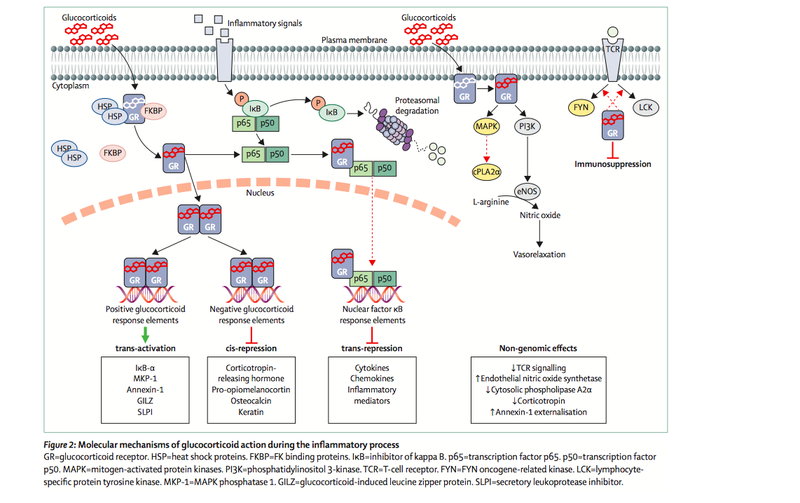 What is adrenal escape mechanism? 5. 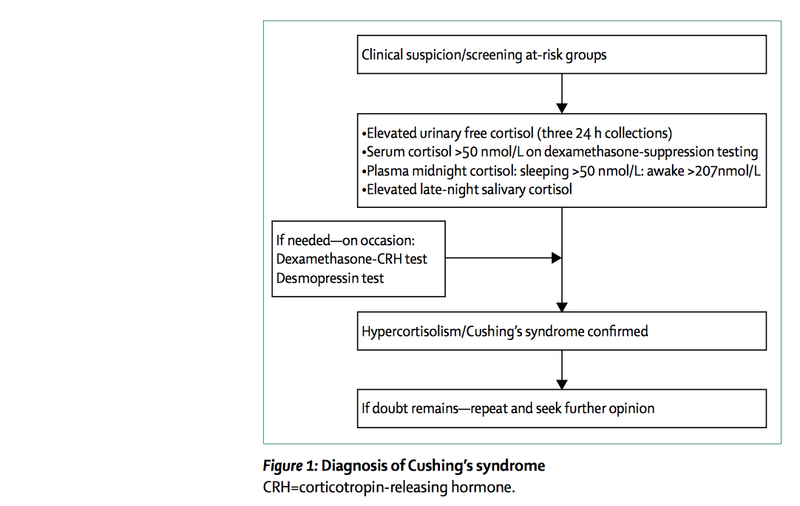 What are the screening and confirmatory tests for conn's syndrome? 6. What are the precautions one should take in interpreting PRA tests results? 7. 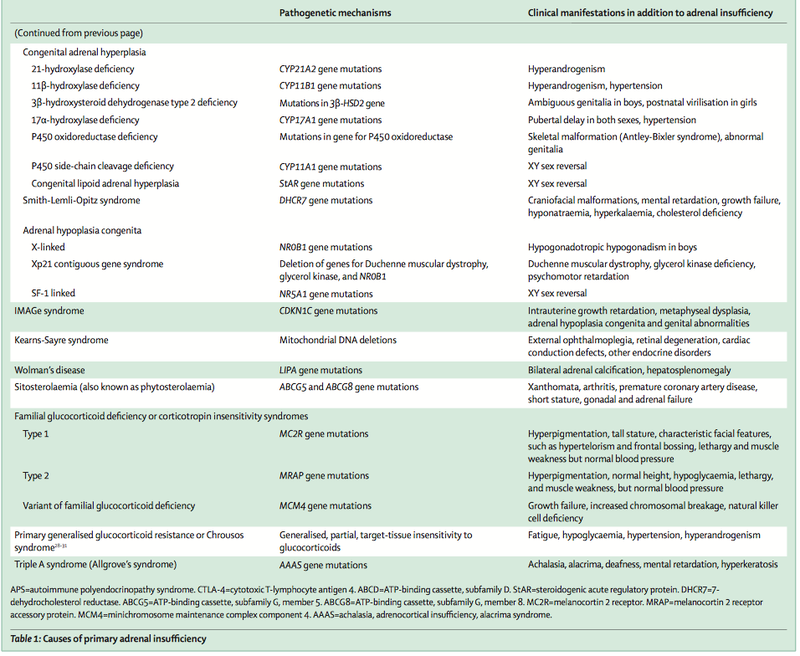 What are the 6 tests for Pheo, and what is the sensitivity and specificity of each tests and how to decide Possible, likely, unlikely pheo based on lab values? 8. 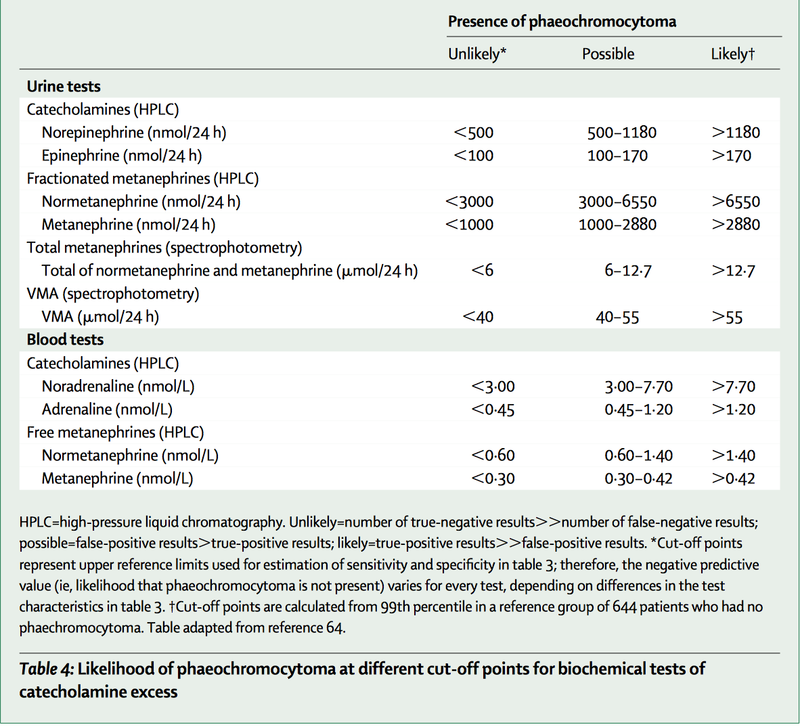 Name drugs that interfere with Pheo assays and in what ways? 9. 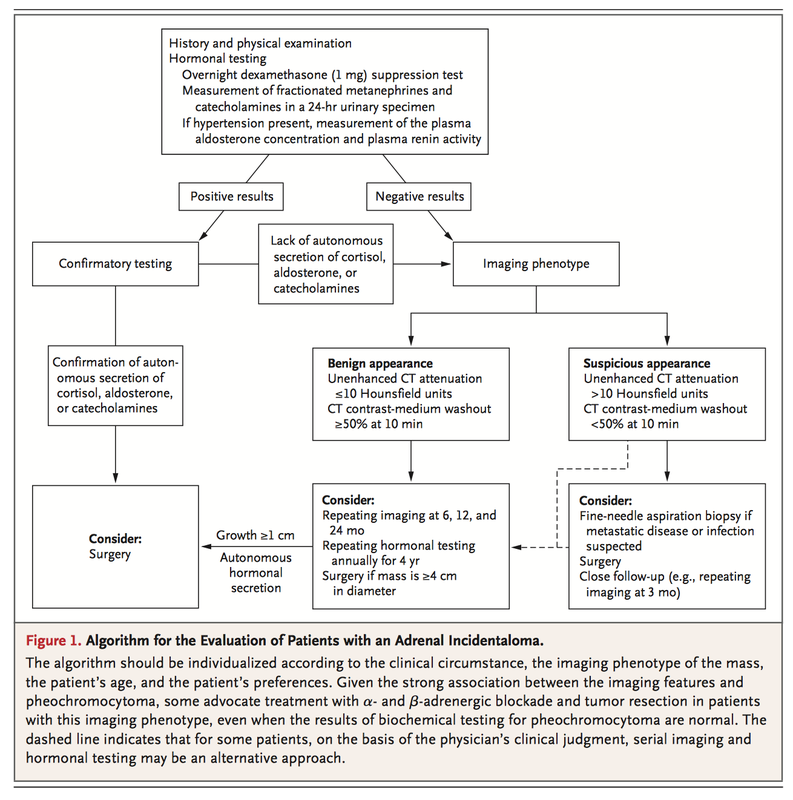 What is the typical radiological findings of Pheo? 10. 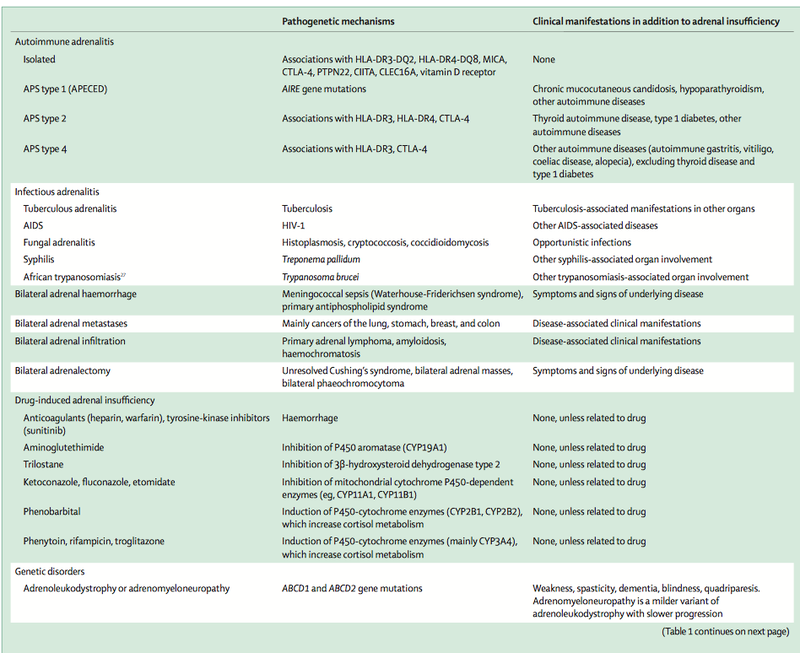 Name 3 Pheo syndromes? 38 yo F with 14 y history of difficult to control HTN is seen in the Clinic. BMP includes the following. 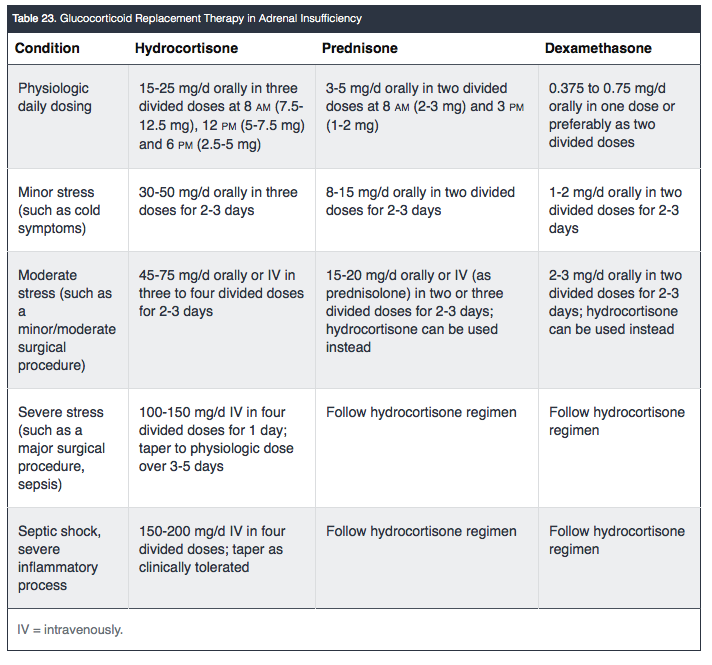 Work up for secondary HTN shows the following. CT Scan to look for adrenal lesion shows 1.3 cm lesion in the right adrenal gland. 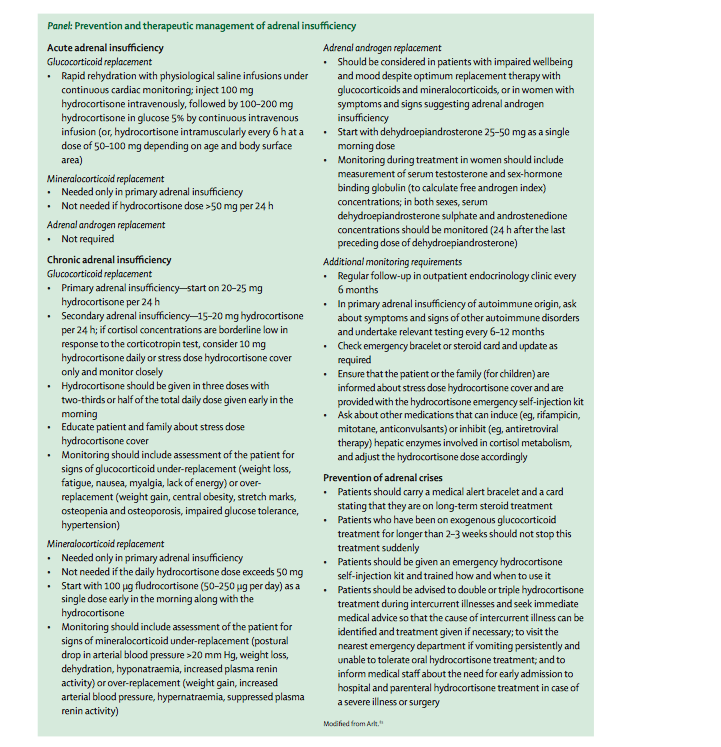 How should this patient be managed? Ans: 2. 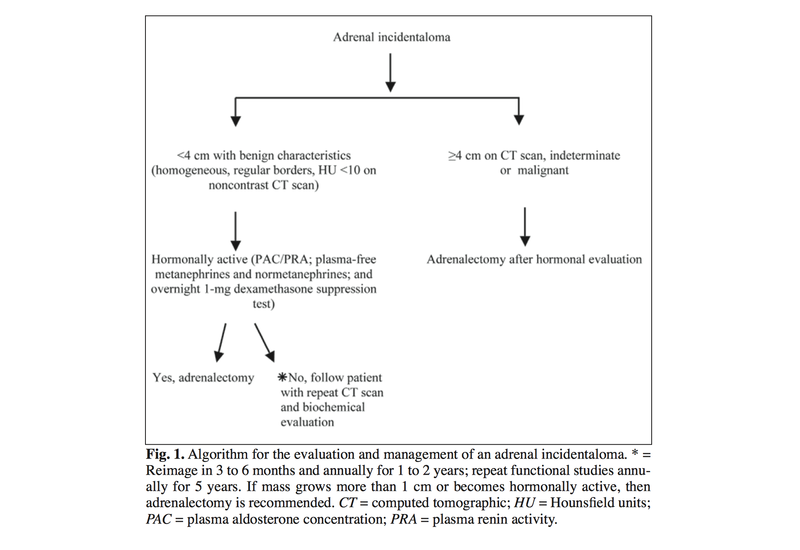 As incidence of adrenal incidenteloma increases with age, and we need to be as certain as possible prior to resection. However, if this patient was 25 yr and had the lesion, then at that age it is not common to have adneral incidenteloma. Hence, could be resected right away. 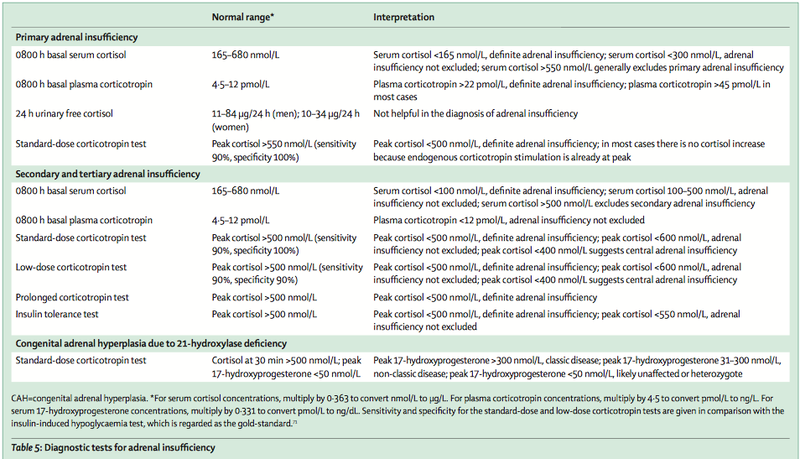 Adrenal Escape: After few days of excess Aldosterone, with > 3 Kg weight gain typically, leads to release of other factors that causes natriuresis to restore the volume status towards normal. Hence, edema is typically absent. 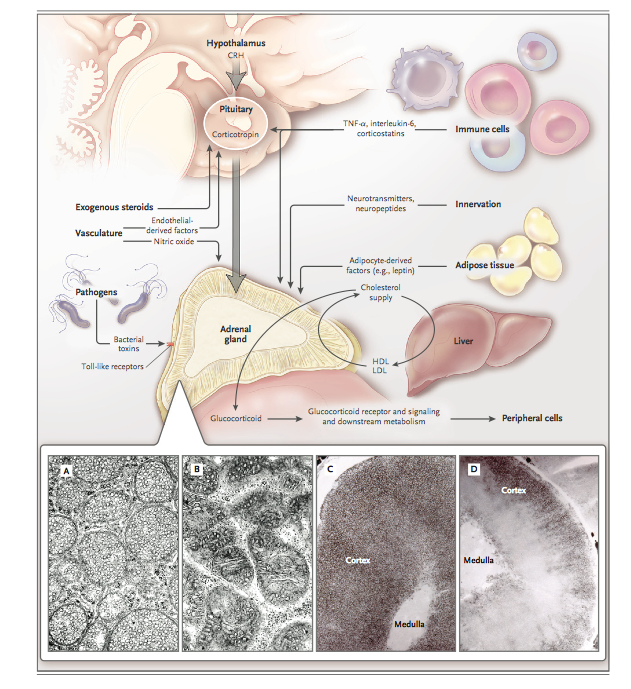 Of note, the action of aldosterone in Cortical Collecting duct (i.e Prinicpal Cell) remains the same. 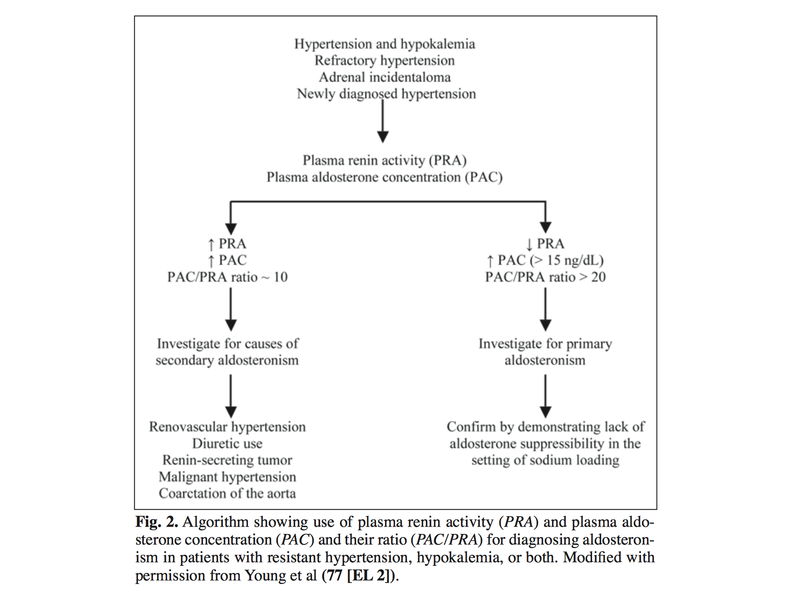 High PAC with HIGH PRA: Can be due to effects of medications. May need to stop medications before retest. 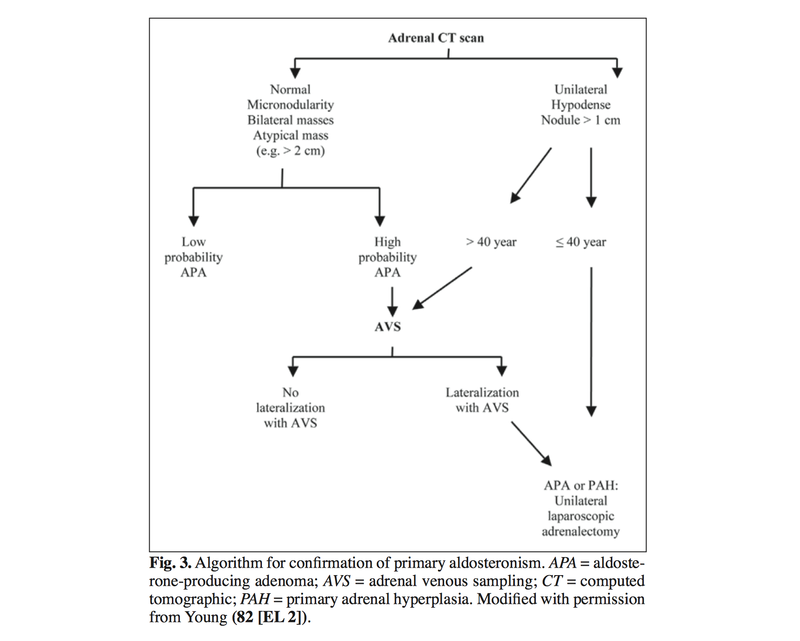 ACEI/ARB decreases aldosterone production, and should lead to increased Renin. Both should suppress PAC to < 5 g/dL normally. Adrenal Adenoma are usually are lipid rich (intracytoplasmic), hence likelihood of lesion with <10 HU (with 98% specificity) in NCCT is nearly 100%. But, even if it is 20 HU, the specificity is still around 85%. There will be around 30% of Adrenal Adenoma will have relatively low lipid in the cytoplasm giving higher than 10 HU in NCCT. MRI is better than CT to distinguish such Lipid Poor Adenoma as MRI is sensitive than CT for intracellular Fat. check DHEAS. 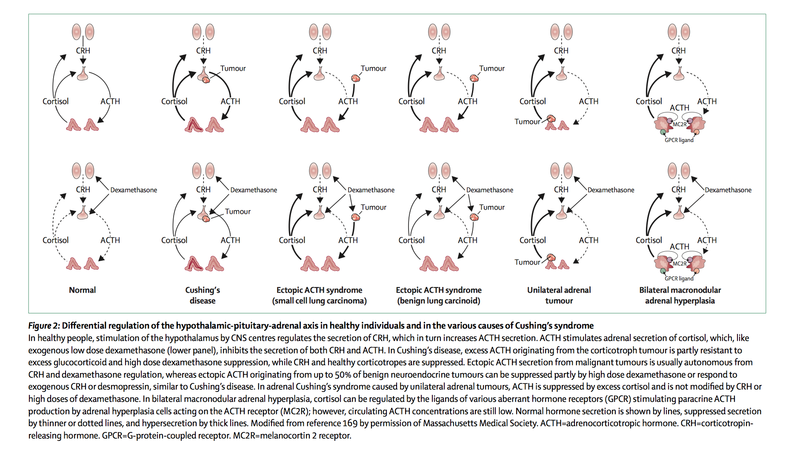 DHEAS in adrenal gland is regulated by ACTH. 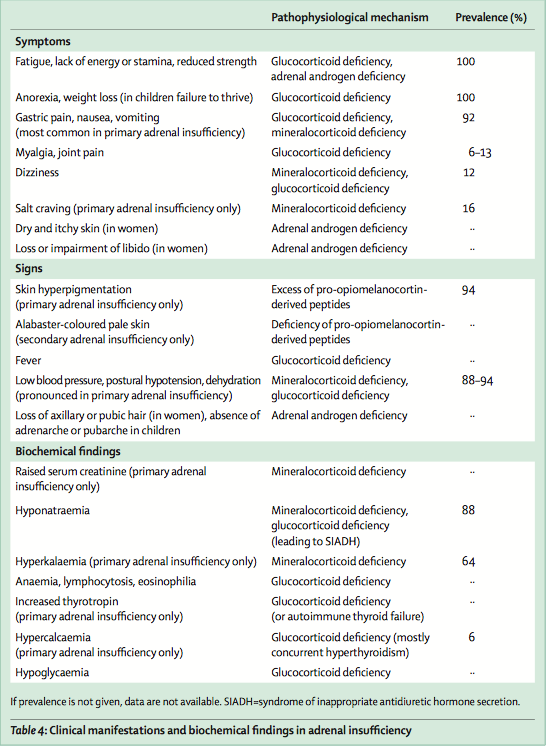 So, undetectable DHEAS points towards chronic suppression of adrenal due to absence of ACTH. 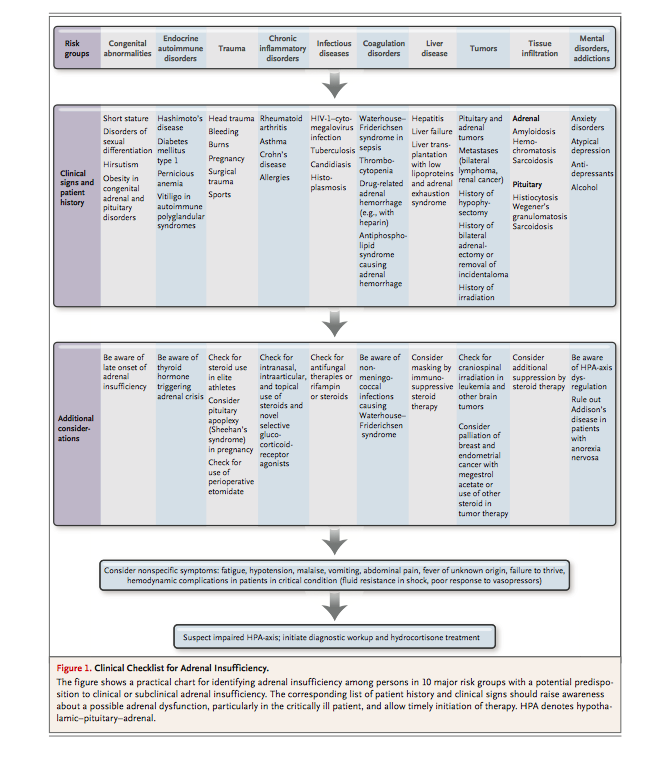 This can happen in subclinical Cushings. Patient on BB, will have low Renin. So, need to be careful on interpretation. Renin will be high, and Aldo will be low. This does not rule out the disease. 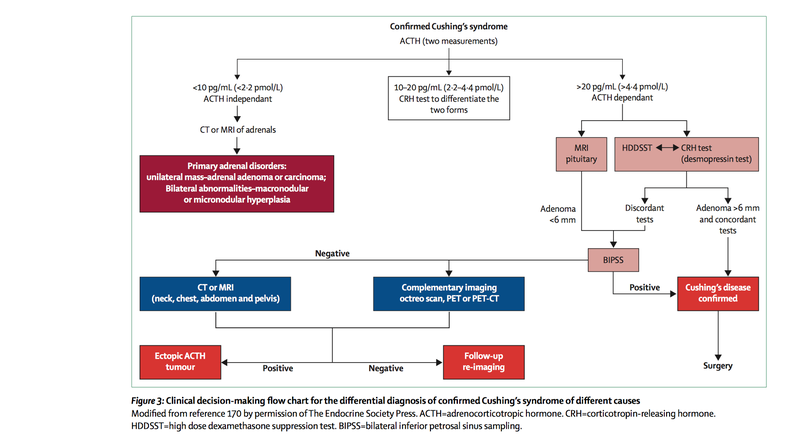 But, if Renin is low, and Aldo is high then it is still helpful in diagnosis. Renin is high due to low volume (feedback). Thus, Aldo is High . Here, high Aldo is not useful for diagnosis. 55 yo M is seen for ESRD, Nephrotic Range Protenuria (still making Urine). BP Is 225/130 on presentation. Labs included the following. Cathecolamins, Fractionated Plasma is ordered. And results is as below. How should one interpret this finding? Values > 4 times normal is highly suggestive. Seems to be the case for Nor-epi, but not for Epi. Additional Urinary Tests are ordered. How to interpret this data? IN addition, PRA is ordered. Lab is as below.